Some people fish from the piers and from the jetty on the breachway. It's nice and relaxing to watch all the fishing boats and lobster trollers glide in and out of the inlet. Alot of people park here in the morning to drink their coffee and read the newspaper. There's small cafes nearby to grab some breakfast too. Egg sandwiches and bagels are the favorite. 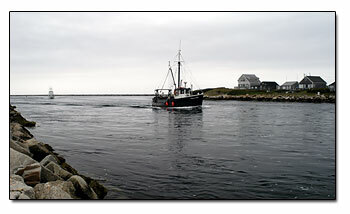 This is a view of the breachway with a lobster boat returning. It is a great place to sit an watch the beautiful sunrise or to take a stroll while you are waiting for the Block Island Ferry to leave. 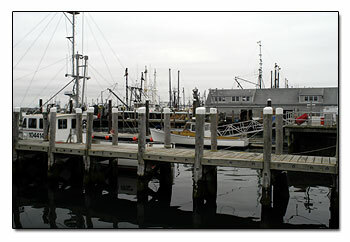 You might even be interested in seeing pictures of the Charletown Breachway, but there isn't a pier there, just a marina.